MediaFire (read about me on wikipedia) is a file hosting, file synchronization, and cloud storage service. MediaFire was first founded in 2006 but in 2014 it did something that really caught my eye. They increased their baseline storage service from 100GB to 1TB and reduced the price down to just $2.50 a month. With the price beating every other easy to use cloud storage service out there I jumped on the deal (which was even cheaper when committing to a whole year) and started using it for my backups and data archives. There are many features that MediaFire has to offer that I do not really making any use of, for example the sharing of files, dropbox style syncing between devices and mobile apps. I simply want somewhere to dump files that I am unlikely to look at or need in the near future. Now as expressed in the title of this article none of my issues are with the MediaFire service itself, simply with the desktop (Windows) client. As outlined in my post about strict comparisons the first issue that I had with MediaFire was that the desktop sync client did not upload any directories that simply had a name of ‘0’. The most annoying issue that happens whenever I am syncing files using the desktop client is that the sessions used for syncing seem to clog my network and bring every other request from every other device on my network to a standstill. Often when leaving the client running for a period of a few hours it will repeatedly crash out and restart. Now I imagine this is just due to a buggy rushed client that I would hope is improving with the crash report from every crash! A funny side effect of this crashing is that sometimes I can return to my machine with 10+ MediaFire tray icons taking up a large portion of my task bar. Generally most tray icons in Windows have a right click action to bring up a context menu, this context menu usually contains items such as Help, About and nearly always Exit. The MediaFire tray icon however likes to be different, the right click action is the same as the left click action, this means in order to close MediaFire you first have to load MediaFire. Anyway, enough of my ranting for now, I do love the service as a whole and hopefully more time will improve the desktop sync client! Lucky for me moving providers is a relevantly easy task should something better pop up! http://www.thewindowsclub.com/mediafire-cloud-storage-desktop-software-review – Points out lots of crashing, could it be something to do with the times and general traffic at MediaFire? http://www.makeuseof.com/tag/5-fileshare-options-work-windows-desktop/ – Also talks about the client being buggy and crashing. http://freebies.about.com/od/computerfreebies/fl/mediafire-review.htm – Mentions no options of bandwidth control on uploads. Experiencing the exact same things! I’m likely going to jump ship somewhere else. Have you given any thought to what service you will be moving to? Currently not sure! I’ll be sure to post when I decide though! > I went Pro like two weeks ago and I have some issues. This thing never stops syncing. Is always syncing at least one file ( I really would like to know wich file is that). 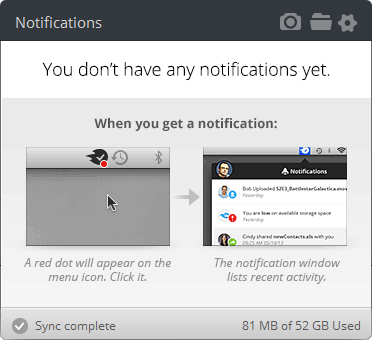 The desktop app is especially aggressive at uploading and persistently results in “upstream saturation”. When you’re downloading data the packets you receive are acknowledged with a small ACK packet that’s sent back to the server. The server will only send the next chunk of data after you’ve acknowledged receipt of the previous chunk. However, because Mediafire is hammering your upload stream these ACK packets get queued and delayed which means all the sending servers sit there waiting for you. Your download capability plummets across the board because of this. The solution is to forcibly prevent the Mediafire app from saturating your upload stream using an application called “NetLimiter” (Windows). If you set Mediafire to only use about 90% of your upload capacity you’ll find your entire network responsiveness returns to near normal levels. This problem was especially common on dial-up connections but still happens frequently on asynchronous broadband connections where your upload speed is only a fraction of your download speed. So to keep you in the loop after 1 year of half using MediaFire I decided not to pay for a second year of the service. Instead I quickly downloads ALL of my data and now simply have it sitting at home. I wonder how many other people abandoned ship like me due to the poor sync client..